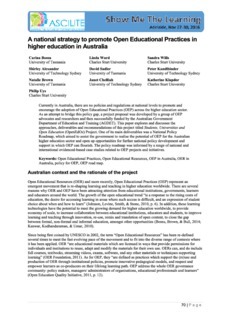 Currently in Australia, there are no policies and regulations at national levels to promote and encourage the adoption of Open Educational Practices (OEP) across the higher education sector. As an attempt to bridge this policy gap, a project proposal was developed by a group of OEP advocates and researchers and then successfully funded by the Australian Government Department of Education and Training (AGDET). This paper explores and discusses the approaches, deliverables and recommendations of this project titled Students, Universities and Open Education (OpenEdOz) Project. One of its main deliverables was a National Policy Roadmap, which aimed to assist the government to realise the potential of OEP for the Australian higher education sector and open up opportunities for further national policy development and support in which OEP can flourish. The policy roadmap was informed by a range of national and international evidenced-based case studies related to OEP projects and initiatives.